Nursery pond liners allow nurseries to store a great amount of water in one central location so that they can easily water all the various plants they need to keep healthy. Also known as nursery irrigation pond liners, these liners can help keep water costs down. In high cost water areas such as California, trucking in water at the correct time or having the ability to analyze different water sources and be able to use that information to purchase and store more affordable water can be very valuable to a nursery. Having a nursery pond also can allow for more direct watering or watering at a larger volume at one time. In some areas there is also a requirement to retain contaminants such as mixed fertilizer or pesticide runoff. These byproducts can travel quickly to areas outside of a nursery without proper containment put in place. 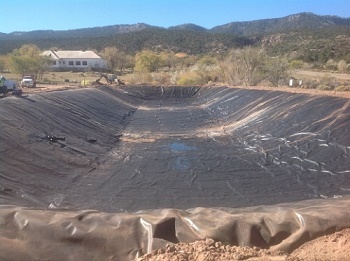 Western Environmental Liner can ensure you receive the best value nursery pond liner geomembrane currently available. Although the best option can change due to things such as location and if the pond liner is buried or left exposed to the sun, we normally recommend our aqua series, although our reinforced polypropylene liners are a good choice as well. Most often the liner can be made in one piece in our factory for easy installation. We can also provide installation if needed. Please contact Western Environmental for your nursery pond liner needs and we will be sure to provide you with the best value option available in the market today.